If Ginger is around, you can schedule a class with her at no additional charge. Yoga is for everyone and every body. In the West, yoga has become synonymous with the postures (asana). Yoga is much more than that. The purpose of yoga, as noted by the sage Patanjali in the Yoga Sutras, is to still the mind. We still the mind to get in touch with our true nature, a reflection of the Divine. Yoga is presented as a knowledge-based, practical system of practice. Ginger, in her teachings, touches on all the limbs of yoga. Her group yoga classes include much more than a simple group of poses. She tailors the class to who is present and gives options to maximize the benefits of a pose or a practice. She always includes some philosophy behind the poses and explains what benefit they bring to the mind/body complex. She makes the class relevant to daily life. 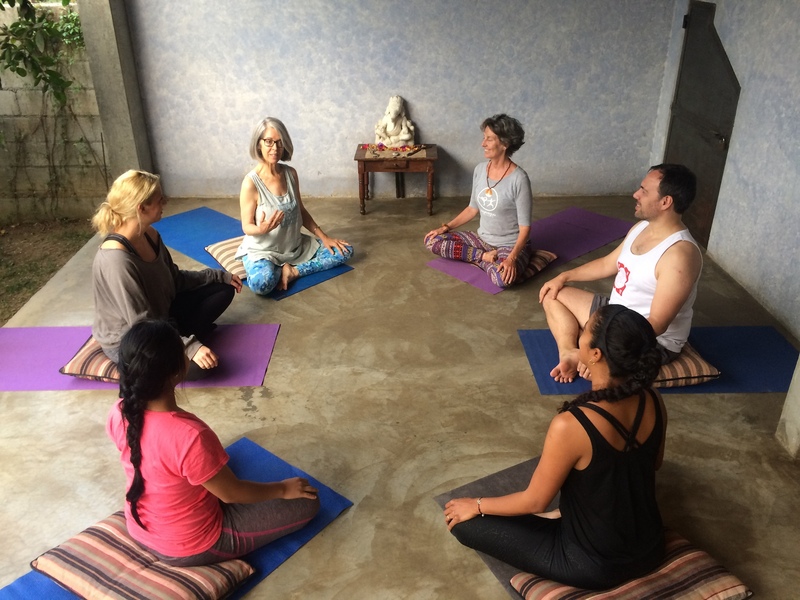 In individual sessions, Ginger uses her knowledge of Ayurveda and tailors the class to one’s particular needs. 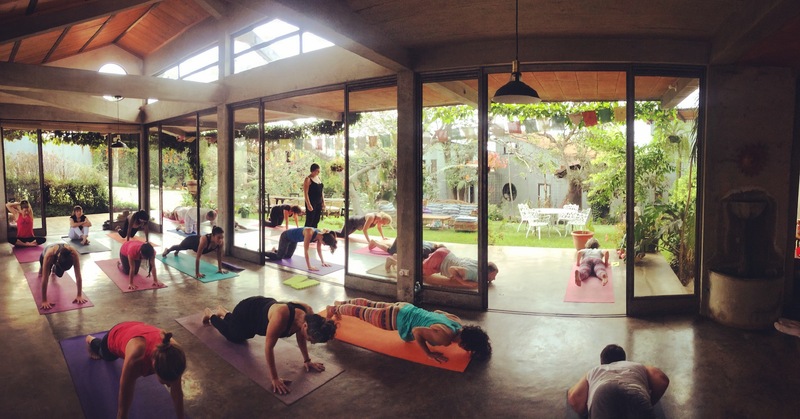 Since Ginger still teaches at Mount Madonna Institute, there are yoga classes only when she is in Guatemala. 2002-2004 Ginger completed a 700 hour Yoga Teacher Training with Georg Feuerstein (Yoga Research and Education Center) at Mount Madonna Center in Calfornia. 2004 – present Ginger is coordinator and teacher in the Mount Madonna Center and Institute’s Yoga Teacher Training programs, both 200 hour and 300 hour levels. 2009 -Certified Ayurvedic Lifestyle Counselor (NAMA approved) 2011 – Certified Ayurvedic Practitioner (NAMA approved) o2016 – Ginger earned a Master’s Degree in Ayurveda from the Mount Madonna Institute. The large glass walled room is surrounded by lush gardens that create a sense of tranquility to assist in finding that space of ease in your body, breath, and mind. Asana props are provided for use. If Ginger is in town, she will lead a morning meditation and/or asana (postures) class should you so desire. If you would like to DONATE for the free class, there is a donation box for Namaste Direct, a local non-profit project which empowers and educates womento be self-reliant. (Namaste Direct).